I’m not about to say the city rushed us, but something about heading to the coast provides a completely different mindset. We left Lake Oswego, headed down a scenic highway with wineries left and right. Had we more time, or a limo driver, Bob and I would’ve been happily tipsy. Since that wasn’t the case, (but a girl can dream), we headed to a winery recommended by Food & Wine, Stoller Wine. Stoller, named one of the best in Oregon, boasted a solar-powered, sunlit tasting room with 180 degree views of the rolling hills of their estate. Sold. If we had one winery to visit, this would be it! The drive to reach Stoller brought endless vineyards, gorgeous estates, and many, many, fruit stands. Our pleasant drive ended before we knew it. Having never done a wine tasting before, Bob and I were happy to partake in their six part sampling, including Pinot Noir, and Reserve Chardonnay that we brought home. We relaxed in the shade before continuing to Newport. 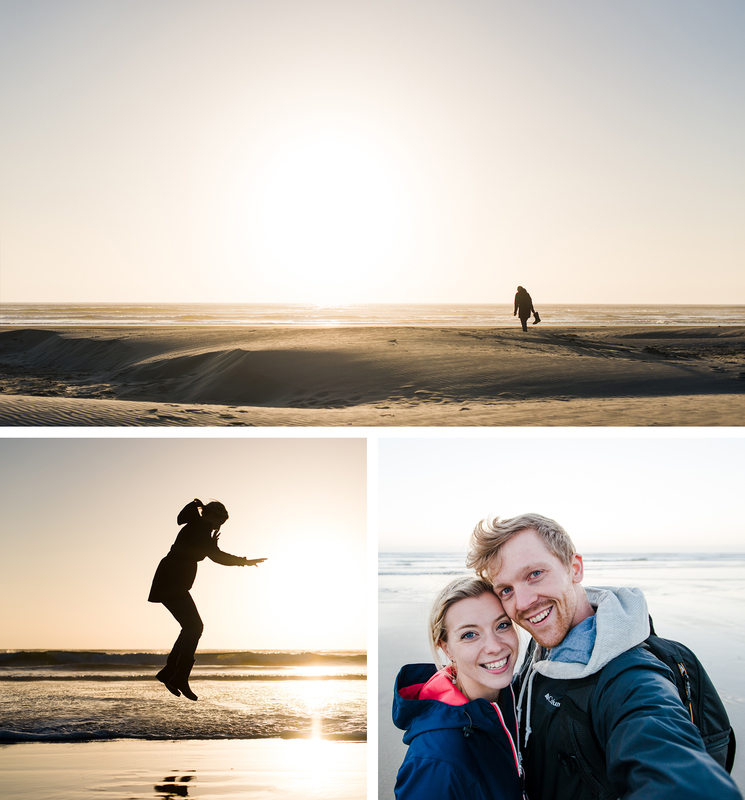 We arrived in Newport just in time to have a lovely dinner with family, and head to Agate Beach for our first sunset. Incredible dunes build up there and shift daily, based on the wind and tide. Bob snapped desert-like photos of me climbing them, rain boots in hand, then we watched the sun ease into the horizon. 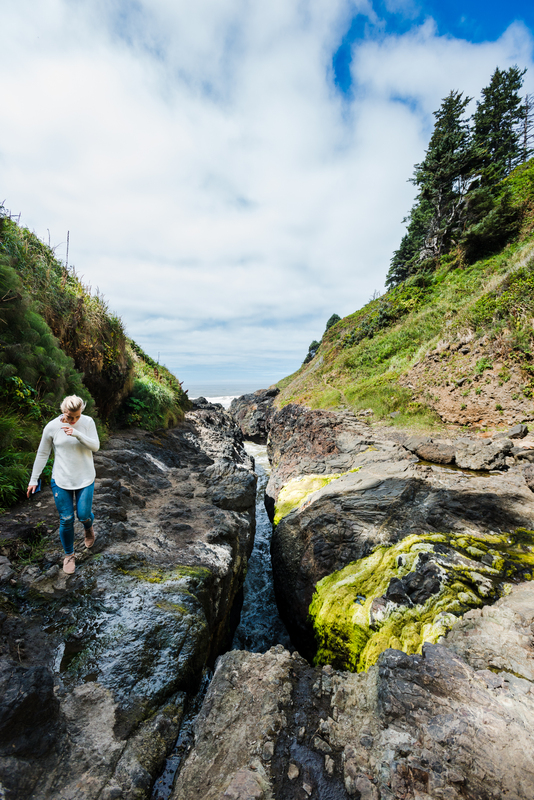 Our next coastal adventure was to explore Devil’s Churn the following morning. We headed south from Newport, and climbed down to the churn itself, where the tide rushed in. 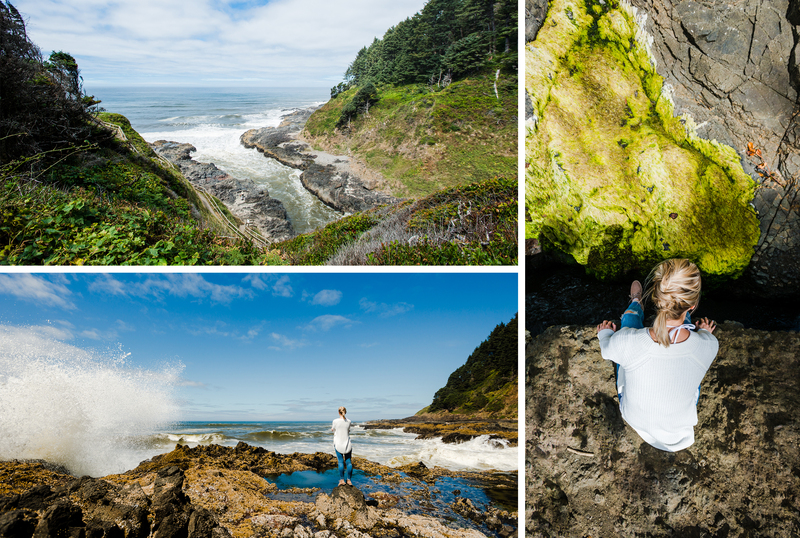 I’m always astounded by the power of Oregon’s jutted coastline. 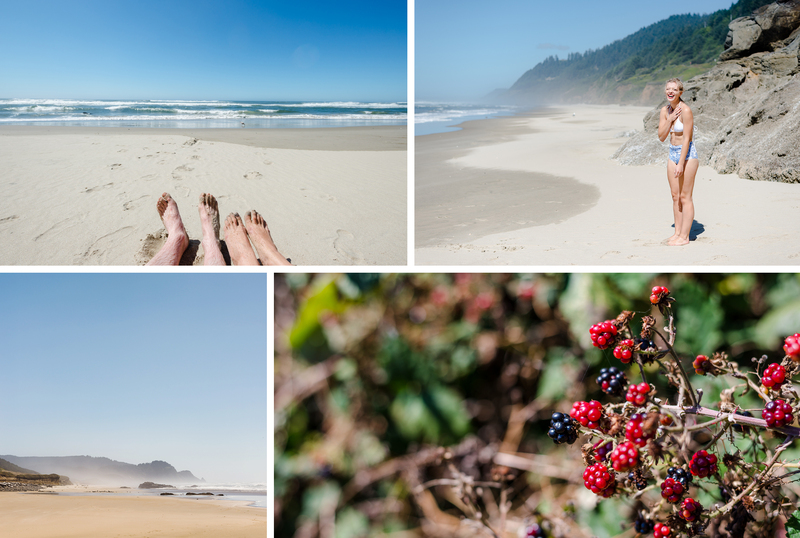 The PNW is the people’s coast, with no portion of it privately owned, so we could venture without any inhibitors. I tend to take full advantage of this. Bob and I scared each other a bit, I think. Me, perching on the ledge of the churn, and him clamoring over rocks to take my photo. What else is new? The remainder of our day included a leisurely walk on the beach, clamoring over rocks to find a completely excluded strip of sand where we dared to venture into the water. That didn’t last long! We really enjoyed it though along with the path back to our car lined with marionberries, which we happily snacked on. 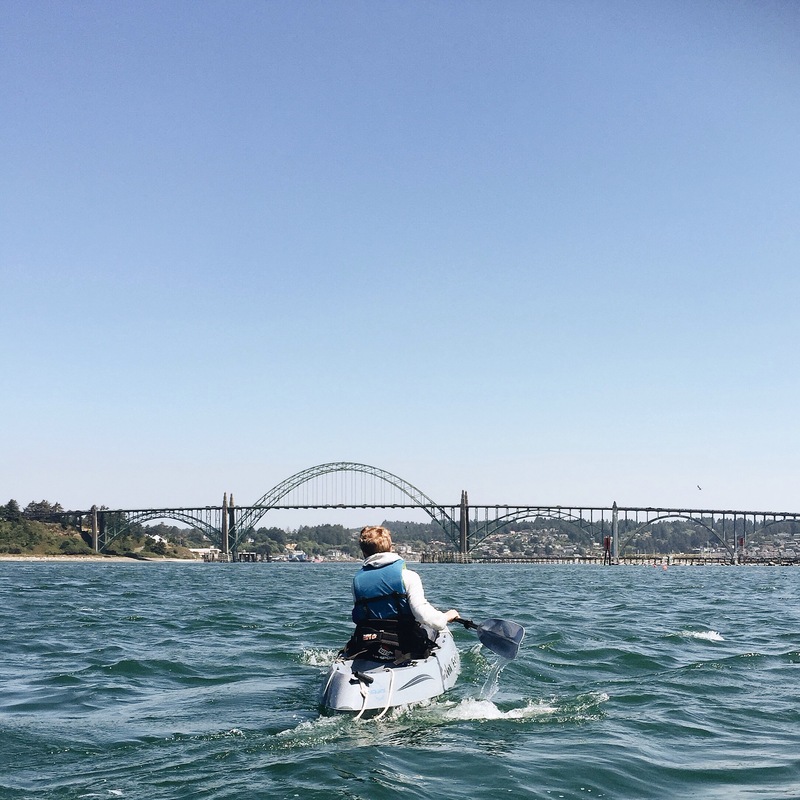 Another highlight of our time in Newport would be loading up sea kayaks and venturing into the bay. It was busy with tourism, fishermen, and playful seals, which I had a rather close encounter with. I paddled out of the way of some boating traffic, and was admiring a seal perched on a far off buoy, when suddenly we heard a splash. Bob turned to look behind me and saw a seal plunge under the water not more than ten feet from my kayak. I’m sad he missed the iPhone photo op by a few seconds, but I think his primary concern was staying above water. Seals really love sunning themselves, and resting on boats, docks, buoys, or anything stationary. Adorable, right? Not so much, when the average seal weighs around 250 – 300 pounds. My kayak would flip too easily with even a brush against our seal friend. Thankfully, we paddled on and saw him splashing a small distance away. What a cool experience! 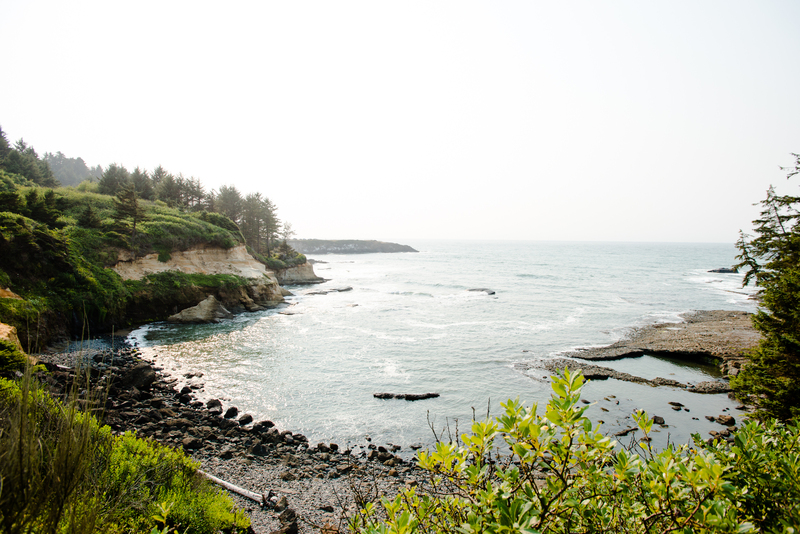 Another favorite for us would have to be our trip to the town of Depoe Bay, and Boiler Bay alongside. The tourist jut out wasn’t terribly exciting, since you can’t see the submerged boiler there during high tide. We decided instead to find a path to the rocky bay below. It seemed that there wasn’t one, so we forged our own, through trees, slippery slopes, and a little jump down to the rocks. Nature is overwhelming, when you find yourself alone. It’s what I long for most sometimes. The two of us stood in the sheltered bay, saw a gently dripping waterfall, and I of course, continued on. I wanted to walk where the water breaks, to a gorge of my own discovery. This, of course resulted in me soaked my rain boots and giggling uncontrollably. Classic Shan. Maybe next trip I’ll be sporting hip waders. I loved this portion of the trip, though I could by no means choose a favorite. As far as the food scene goes, we hit up Rogue Brewery, and enjoyed some fresh seafood a couple times a day. Rogue brought another tasting tray of spirits – a really nice treat!